Longtime socialist Nicolás Maduro was elected president of Venezuela on April 14, in a crucial election held five weeks after the death of revolutionary leader and president Hugo Chávez on March 5. 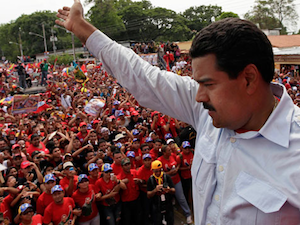 Notwithstanding the close vote count—50.8 percent to 49 percent—Maduro’s presidency is a critical victory for the Bolivarian revolutionary process and the United Socialist Party of Venezuela’s ongoing struggle for socialism. On April 19, Maduro will be inaugurated in an historic day for all Latin America and a reaffirmation of the great Bolivarian Revolution begun by Chávez. Yet, as thousands of Venezuelans broke out in celebrations across the country after Maduro’s victory was announced, the defeated right-wing candidate, Henrique Capriles, refused to concede, following his script written in Washington. Before Sunday’s vote, U.S. imperialism and the Venezuelan right wing crafted a plan of action to distort the electoral outcome and create violent chaos afterwards, knowing Capriles’ defeat was likely. Sunday night, April 14, the violence was unleashed. Seven pro-Maduro supporters were murdered after Capriles called for street actions, giving the green light to his fascist followers. TV and radio stations were destroyed, the homes of PSUV members burned down or vandalized, and people beaten in the streets by roaming right-wing gangs. One right-wing reporter, Nelson Bocaranda, falsely claimed to his 1.2 million Twitter followers that Cuban doctors were hiding ballot boxes in CDIs, the free health clinics run by 38,000 Cuban medical workers. Several CDI clinics were suddenly attacked across Venezuela in actions obviously coordinated beforehand. Two persons were murdered trying to defend a CDI clinic under attack. Maduro is trying to prevent a massacre similar to what occurred on April 11, 2002. As a prelude to the coup against Chávez, the right wing led a similar march to downtown. There, fascist sharpshooters gunned down and killed 11 people, as a cover to justify the coup. Today, April 16, at the last moment, Capriles was forced to back down and announced the cancelation of his action. Also today, a government Official Gazette announced that all police forces, national, state and local, are immediately suspended from active duty—“confined to barracks—until Saturday evening, except by express permission. In their place, the Bolivarian National Armed Forces (FANB) are to provide public security. The declaration also prohibits the carrying of arms in public for the same period, to prevent further violence. The U.S. government has spent hundreds of millions of dollars since Hugo Chávez first took office in 1999, to destabilize the country, counter-organize and even stage a coup and carry out oil sabotage. Its campaign continues. In Washington on Monday, April 15, President Obama’s press secretary, Jay Carney, insisted on a 100 percent audit of the vote, effectively refusing to recognize Maduro’s presidency. On Tuesday, U.S. State Department spokesperson Patrick Ventrell repeated the demand. In Caracas, National Electoral Council President Tibisay Lucena has rightfully refused Capriles’ 100 percent recount demand, declaring that 53 percent of the votes were audited, in a process recognized internationally for its exceptionally high standards. Her home was violently attacked afterward. Meanwhile, Latin American governments across the board are sending congratulations to Maduro and backing Venezuela’s transparent electoral process. Ecuadoran President Rafael Correa has called on Latin American presidents to attend Maduro’s inauguration in a show of support. Hour by hour the people of the Revolution are responding with a combative will to defeat the right. Today, April 16, more than 200 community defense units of a new Popular Front in Defense of the Bolivarian Revolution and Peace were created and announced on Venezuelan state television. Hundreds of community radio stations are linking together to share information on the right-wing attacks and to help mobilize the people to defend the peace. With the right-wing threat, it should be clear that Sunday’s vote was much more than a contest between two individuals. On one hand is the Bolivarian Revolution process of 14 years. Huge transformations have been carried out in the economic and social realm: free health care, massive housing projects for the people, education, and the mobilization of millions of people committed to the ultimate objective of socialism. On the other is the counterrevolution, whose candidate Henrique Capriles—backed by the Venezuelan élite and U.S. imperialism—appealed to the wealthy and middle class and promised a return to the “free market.” He called for the dismantling of Cuban-Venezuelan cooperation. Venezuela’s rising revolution is causing great consternation within U.S. ruling circles because it is building people’s power and inspiring all the people of Latin America and the Caribbean. Maduro, the government and the people will now move ahead with the “Plan de la Patria” —the socialist plan for the nation—first unveiled by Chávez in his presidential run last fall. The millions of Bolivarian supporters who have been mobilized in the streets for more than four months will now be decisive, to defend the Revolution, defeat the right wing and guarantee a life of dignity and peace for the Venezuelan people.